Please refer to our stock # 1-0446 when inquiring. Statue of crowned Buddha, in royal attire, his hands in "bhumisparsa mudra" (taking the Earth as a witness of the veracity of his sayings), sitting cross-legged on a tall throne. A hole at the top of the crown suggests the presence originally of a finial, now gone, while a hole at the back means that the statue was held firmly in a niche via a tenon. Marble, with numerous remnants of the original pigments. Burma, 17th century. Height: 10 1/4" (26,5 cm). Despite chips in some areas and obvious signs of great age, the piece is in very good condition. A charming and unusual piece. Note: the style of this statue derives from Eastern India aesthetics, as was often the case of Buddhist statues found in the Pagan site, in Northen Burma. 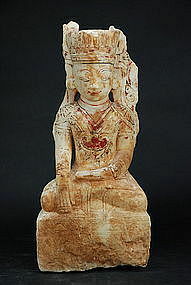 Alabaster Statue of Buddha, Burma, 17th C. Statue of Buddha, Thailand, Ca. 17th C. Head of Buddha Burma, Early 19th C.